Two Girls Working is a collaboration of artists Tiffany Ludwig and Renee Piechocki. 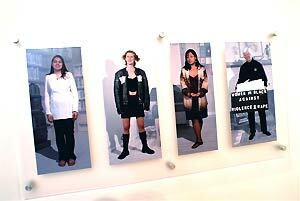 Their project Trappings, an interview-based artwork, starts with a simple question: what do you wear that makes you feel powerful? Two Girls Working has sought responses from diverse groups of women at interview sessions in each region of the United States. Over 500 women have gathered in private homes, classrooms, boardrooms, and community spaces to present their complex stories about power, clothes, and identity. 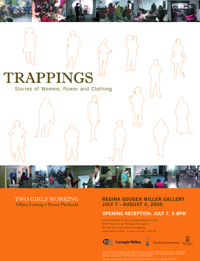 The Miller Gallery at Carnegie Mellon University is hosting the launch of Two Girls Working’s national, traveling exhibition. Although the project begins with a question about clothing, Trappings is not about fashion. 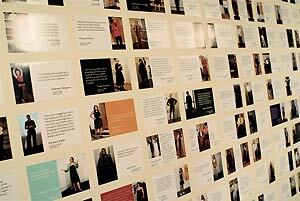 Clothing is simply the vehicle to access a larger dialogue facilitated by the artists. 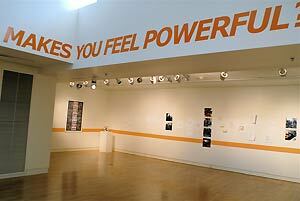 Through photography, audio works, video installations, and project ephemera, visitors encounter the diverse range of issues women present related to power and identity.